- Product Overview: AC 0-20A full range of linear detector, with relay output. - Specific debugging method: measuring voltage threshold voltage test points, at this point, 0-5V voltage equivalent to current 0-20A. 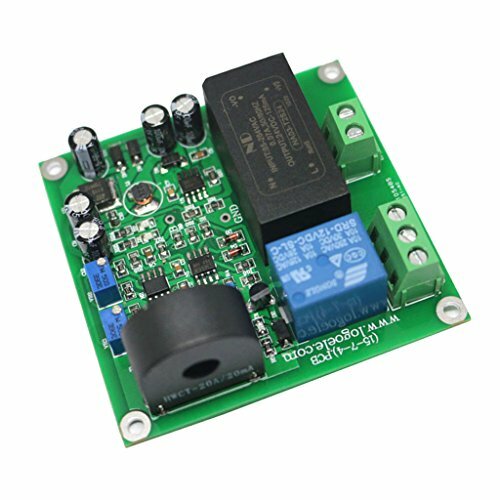 - Detection does not exceed 20A AC current, B point on the board is analog output, 0-5V linear corresponds to 0-20A, can be soldered for collection, can also be used as overcurrent protection, and can be directly powered by AC85-264V. - The module is automatically restored and is not directly used to control the on/off of subsequent circuits. It needs to be connected to the controller or add a delay relay. - Type: with Base, without Base. Thanks for your understanding and enjoy your shopping moment. * Detection does not exceed 20A AC current, B point on the board is analog output, 0-5V linear corresponds to 0-20A, can be soldered for collection, can also be used as overcurrent protection, and can be directly powered by AC85-264V. * Product Overview: AC 0-20A full range of linear detector, with relay output. * The module is automatically restored and is not directly used to control the on/off of subsequent circuits. It needs to be connected to the controller or add a delay relay. * Specific debugging method: measuring voltage threshold voltage test points, at this point, 0-5V voltage equivalent to current 0-20A.